Made of space grade aluminium, the Ohm Tuning Fork will not go out of tune, and holds the vibration well after being activated. Package includes Ohm Tuning Fork & Activator, as well as a booklet containing an Overview of Sound Healing, and Simple Instructions for Use. Considered the primordial sound from which all other sounds emanate, the Ohm tone is an excellent place to begin for those interested in Sound Healing, and is the chosen tone used by many seasoned Sound Healers. The Mid-Ohm Tuning Fork is 136.10 Hz, and is being middle range, is widely considered the classic Ohm frequency. The sound vibration of Ohm is relaxing and energizing. Resonating with Ohm can enhance breathing, relieve body tension, assist in meditation and pain management, and help facilitate yoga poses. 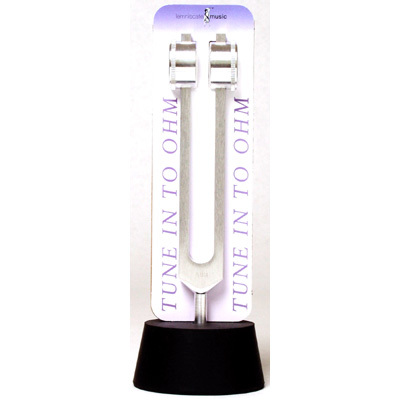 The sound wave created by the Ohm Tuning Fork works like kinetic energy to move disharmony and tension from the body while restoring a sense of well-being. Made of space grade aluminium, the Ohm Tuning Fork will not go out of tune, and holds the vibration well after being activated. Ohm, also spelled Om, is a specific frequency (136.10 Hz) and was known by the ancients to be the most powerful vibration.